Christian church pioneers came from California, Iowa, Missouri and many other states. They journeyed by wagon train, steamer and on foot, and after many hardships and disappointments they reached this area, one of the last in the nation to be settled. Some of these early Disciples were members of the famous Crabtree Train that came over the old Oregon Trail, and others were passengers on the "Great Oregon," a steamer that carried many members of the Christian church around the Horn. The steamer foundered on the Columbia River bar, but all on board were rescued. To this new land these pioneers brought precious libraries of Christian literature in their oxcarts and in their steamer trunks. It was a custom of members of the church to bring as many unconverted people as possible to these meetings with a view to their conversion. A Mr. Olson was the first convert at Cold Springs. After he had confessed his faith, he was asked when he wished to be baptized. His answer was, "In the same hour of the night." The baptismal pool was almost a mile away, and the grass was knee-high and wet with dew. The leader carried a lantern on his head, and the congregation, led by N. E. Ware, walked toward the water, singing as they walked, "Go Wash in That Beautiful Spring." According to N. E. Beach, who was present, "It was something new for the stillness of the night to be thus broken, and the coyotes answered back quickly, but in a weird, unknown tongue." The gold rush at Pierce gave Grangeville its start. It is located nearly in line east with the south boundary of Washington State. When the town members established Charity Grange No. 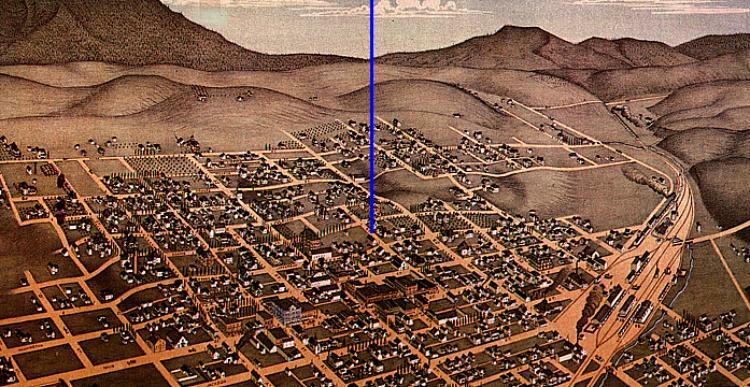 5 they voted to have Grangeville for the town name. This was about 1861. About 20 years later Edward A. Chase, a disciple of Abbott Levi Todd in Douglas County, Oregon, moved to this vicinity and was invited by Eliza Adkinson to preach the first sermon by a minister of the Restoration Movement. The meeting was in the Adkinson family home, about four miles west of Grangeville. The Adkinson family had been Christians in Illinois. 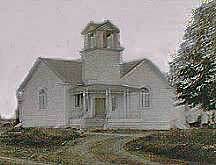 The first regular services were held in Farview School, six miles northeast of town. 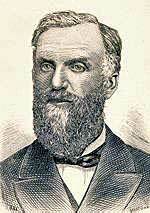 Later, John Kincaid from Kansas, an elder, led the church. In the fall of 1895, three preachers arrived to launch a congregation in Denver, 10 miles north of Grangeville. These were George F. Stivers, Robert Edmund Dunlap and William Baskett. This organization continued until until after the Grangeville church was organized and then merged with Grangeville. John Kincaid formed another congregation is the Winona section about 1899 in the home of John Keller. That church later moved to the school house in Red Rock, about 20 miles north of town. The group built a building at Winona in 1902. 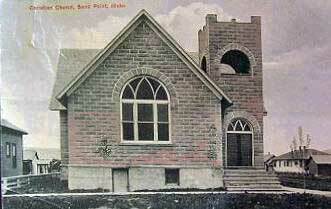 Later it, too, merged with the Grangeville congregation. In the summer of 1895, Stivers, Dunlap and Baskett held a tent meeting in Grangeville, although a church was not launched at that time. In 1901, Leroy F. Stephens arrived from church planting in Portland to hold a tent meeting and immerse 16 into Christ, making 28 charter members to launch the congregation. Then those from the outlying congregations joined their number and their first building, built in 1901, was soon overwhelmed and had to be replaced with a large one. Before he was converted to Christ, L. F. Stephens had been a contractor and builder. Without a doubt, he used his skills in the construction project here as well. Some towns have adjusted their location a mile or two, but Lewiston was first established 75 miles to the east, then moved to its present location. It was the first town in Idaho to incorporate. The Lewiston Church grew out of early camp meetings held in Tammany Hollow. The date was about 1896, with Freeman M. Walden holding a gospel meeting. Further meetings were held by Robert Edmund Dunlap and C. F. Goode. As a result, the church was organized in February of 1897 with 16 charter members. Meetings were first held in a private home and later in the Grand Army of the Republic (G.A.R.) Hall. A building was dedicated to the Lord's service in 1899. Some unnamed congregation in the Lewiston vicinity was established by James A. Campbell in 1887, according to a report in the Christian Standard of that year. It began with 10 members. Was this a church in Tammany Hollow before the time of the camp meetings? Also, C. C. Gibson send a report dated December 11, 1887 to the Christian Standard saying that "One confessed her faith in Christ last Lord's day and was baptized today." The first permanent settlers arrived here about 1870. After having several unofficial names, Samuel Neff, became the first postmaster and named the new community after Moscow, Pennsylvania. The church was organized in 1870 by Cyrus Jefferson Wright with his wife Hannah Margaret Beals Wright. Moscow, Nes Perces Co. , Feb. 14. -- A three weeks' meeting has lately closed here conducted by our beloved Bro. C. J. Wright, and assisted by Bro. Amos Buchanan, both able proclaimers of the word, and workmen that need not be ashamed. Immediate results 50 additions -- 20 by commendation, 5 from the sects, and 25 by baptism. The church much encouraged and now numbering 100 members. Just previous to this meeting Bro. Wright closed a meeting on Four Mile with 31 additions, 6 from the different sects and 25 by baptism. . . "
We have retained the spelling and punctuation of the original article. When I came to this country in September last, I found a few disciples scattered like sheep without a shepherd, almost ready to give up in despair. I immediately began to preach for them. Since that time I have immersed thirty-six persons -- fifteen of whom were Methodists, and a number of others from the sects, who had been immersed. We have now five organizations in good working order in Whitman county, Washington Territory, and Nez Perces county, Idaho Territory. Names associated with the earliest days of the Moscow church include Henry M. and Paulina Rogers, overlanders of 1853. They moved to Moscow in 1880 from Lane County, Oregon. Linus Rogers was the preacher here in 1888. He may have been related to Henry and Paulina. Their daughter Elizabeth married Levi Geer of Hebron, Lane County, Oregon. Linus Rogers said that his daughter lived near Moscow. Charter members of the second congregation were: Mrs. W. A. Baker, Mr. and Mrs. T. N. Cheekmur, Mrs. S. A. Craig and son William and daughter Ida, Mr. and Mrs. D. W. Driskell, Mr. and Mrs. J. W. Ellis and son, Mrs. Warren Gano, Mr. and Mrs. A. J. Green, Mrs. B. A. McGuire, Mr. and Mrs. William Riggs, Mr. and Mrs. L. Rogers, Mr. and Mrs. John Russell and daughter, and Mrs. Priscilla Taylor. The original congregation disbanded because of dissention and was brought back to life again under the leadership of Linus Rogers. When Linus Rogers reported about the congregation ten years later, it numbered 40 members. They were able to build a church house and it was dedicated by Robert Moffett on June 14, 1891. That building was replaced in 1924. The following year B. J. Dillon of Palouse City conducted a gospel meeting and wrote, "Bro. Rogers is a true yokefellow, indeed. He has done a good work at Moscow." Late in 1892, Thomas McBride Morgan of Hatton, Washington changed his address to Moscow, Idaho. We suppose that this seasoned gospel preacher moved here to preach. In mid-1894 R. L. Lotz arrived to lead the congregation. Linus Rogers had died suddenly at the end of 1893, and Lotz wrote to the Christian Standard, "Bro. Rogers did a splendid work here." There were crowds. John Fletcher Ghormley and James W. Webb held a night-to-night meeting in 1895 when R. L. Lotz was the minister and reported audiences of 600 to 1200 each night. school at 10:00 a. m., Christian Endeavor at 7 p.
m., Prayer meeting Thursday at 8:00 p. m. E. R.
There is a panoramic view of Moscow showing the location of the Christian Church on this local link. The church now supports three native evangelists in Africa. All obligations were promptly met by free-will offerings. No money is raised by socials, entertainments or sales; no debts are incurred. About 70 were added to the membership during the year and about 50 have moved elsewhere. Mr. Black also launched a Christian College in Moscow, but there is little record of the school. We know that it met in rented facilities down town. The church has merged into the United Church of Moscow. This small community was first named Four Mile because of the Four Mile Creek parallel to Main Street. Later it was name Viola, in honor of the first postmaster's daughter. Viola was a mill town, at one time heavily dependent on logging operations. Although the church is not mentioned by historian Orville Peterson, it was in existence in 1884. In fact, the town was a going concern with two general stores, two boarding houses, a school, a blacksmith, livery stable, five saloons, and a grist mill. The Star-Mirror of Moscow reported in its September 23, 1909 edition that the school and blacksmith shop had burned. Classes were moved to the Christian Church and it, too, burned in a few days. The young arsonist was apprehended. Following this, he attend a different kind of school -- a Reform School. Both the school and the church were rebuilt in 1910. Originally named Vollmer by banker John Vollmer, the name of the town was changed at his death to Troy. Because of his farm foreclosures, the citizens did not want to immortalize his name. 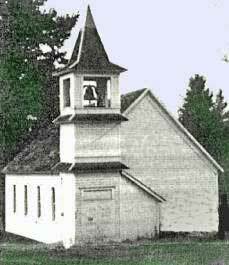 Linus Rogers of Moscow held a gospel meeting at Vollmer (the one in Latah County) in 1892 and organized a church with 47 members. An alternate report is that 16 were charter members and 60 others were quickly added. The charter members included: M. B. and Margaret Peterson; Allen W. Henry; Susan and Phoebe Summers; John C., Leona, Jane and Julia Daniels; Dora, Ida and William Robinson; S. Y. Addington; Basil Hall and William Plunkett. The building was located at East Fifth Avenue and Elm, the west corner of the intersection. Students from Spokane University preached at Troy on the weekends. Passenger train service was frequent. In 1903 Emmett A. LaDow was preaching at Troy full time. The church was still active in the 1940s. In 1986 the property was donated to the school district. According to the Lewis County Herald, the first organized meeting of the Christian Church was a Sunday School held in Mockler's Hall. A camp meeting, led by Mr. and Mrs. L.F. Stevens was held at the New Hope School on the NE corner of New Hope and Power Line Roads. Another meeting was held at Nezperce the next year (1901) and J.A. Pine was retained as the local evangelist. By 1902, the group had purchased ground on the northeast corner of 4th and Pine and built a building. They were about 80 in number and the building was free of debt. The building, built with volunteer labor and lumber from the area, cost $50. The floor plan shows a 26 x 40 foot building with a 7 x 7 bell tower and a bell. In 1909 two additions were made to the original auditorium and that is the photo that we show here. W.L. 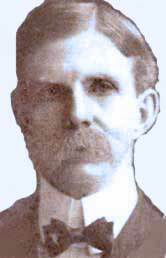 McCullough led the church for a year (1903) followed by Judson Brown. He had received his Biblical education at Alexander Campbell's Bethany College in Bethany, West Virginia. Judson Brown was an active church planter and was also working 24 miles north in Peck, Idaho during this same 1904. Other ministers were H. Weed (1905), Edwin F. Beaudreau (1906-07) and George Ellis (1908-1911). Our appreciation to Thomas A. Pfaff for gathering useful information for this entry. Coeur d'Alene was named by French-speaking traders who also named the Coeur d'Alene Indian Tribe. The most common theory for the name is that trappers considered the local Indian community sharp traders, hence the defining name, heart of an awl. According to its own written history, the Christian Church met first on September 25th in 1904. They quickly made plans for a church house. Land was donated by Captain O'Brian. The congregation built their building prior to 1908. It was located at 816 East Indiana Ave. That was near the intersection of Indiana with North 9th. The building in the photo shows an entry way that is not present on the fire map of 1908, so we believe that is was taken after the remodeling of 1911. The entry way would allow the doors to be opened without drastically affecting the temperature in the main area. The first minister was O. J. Gist. He spent part of his time in mining his own claim. It should be noted that Davis Errett was also located here at one time. The church sold their property in 1914 and rented for some years until building again in 1935. Names associated with the earliest days of the church include H. H. Ball, Mrs. Dora Burton, F. M. Burton, Mrs. Anna Doble, R. N. Dunn, Mrs. Earl Hamilton, Charles LeDean, F. M. Manley, W. L. Miles, Mrs. Helen Morris, C. J. Shoemaker and H. B. Treff. Church planter J. B. Lister began services over a meat market in the Fall of 1908. The space was later occupied by Taft's Department and Variety Store. There were eight charter members. By the following May, the church layed the cornerstone for a building at the southeast corner of Cedar and N. Forest Streets. Attending the event were the Sandpoint mayor, C. F. Stevens of Central Christian Church in Spokane, and J. B. Lister. There were 62 members at the time. Financial limitations soon loomed, so the building was sold to the Baptists, only to be repurchased in a few months. 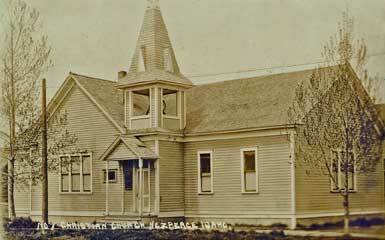 By 1912, the congregation had the largest Sunday School attendance in Bonner County.